For the first time since its proclamation, the European Commission will incorporate the European Pillar of Social Rights in the European Semester 2017/18. However, the potential of the accompanying social scoreboard to identify social ills in the EU is used inadequately. On the one hand, the member states are reserved, on the other hand, there is no change in the dominance of budgetary and competition-related social objectives. The latter are the most likely to have a chance to enter reform recommendations if they are compatible with economic coordination goals. 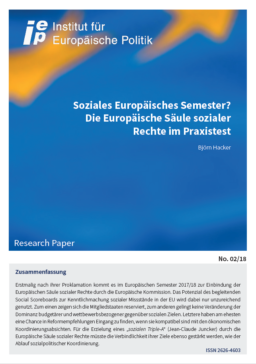 To achieve a “social triple A” (Jean-Claude Juncker) through the European Pillar of Social Rights, the binding nature of its objectives should be strengthened, as should the process of social policy coordination. You can find the whole text here (in German).